WILD AT HOME: Orphaned Himalayan Black Bear cubs rescued from the forests of western Nepal last May are now looked after at the Central Zoo in Jawalakhel. 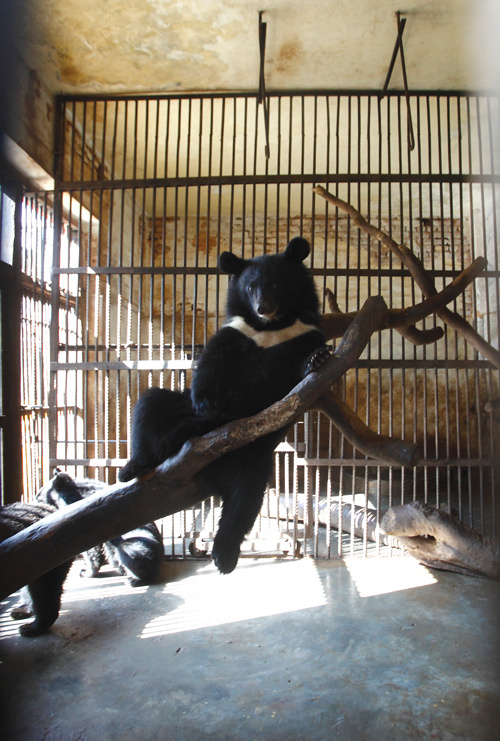 Three Himalayan black bear cubs whose mothers were probably killed by poachers for their gall bladders to be sold in China as traditional medicine would have most certainly died had the rescued animals not been brought to the Central Zoo. 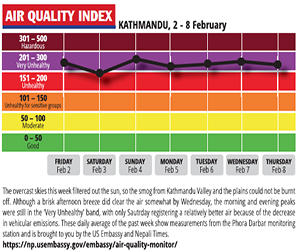 Two of the cubs were found in Doti and one in Jumla, and transported to Kathmandu in May last year when they were just two months old. The triplets had little chance of survival without their mothers, and without the specialised attention of vets at the zoo. “Alone in the wild they would not have got the needed care and maybe the poachers would have got them,” said Ganesh Koirala, assistant curator at the Jawalakhel Zoo. Smugglers across the mountains are killing the endangered bears to take out their gall bladders, skin and paws for sale within Nepal and in China. Fed six times a day, the cubs are now healthy and chubby and have become one of the most popular attractions at the Zoo. The Zoo is now serving as an important sanctuary for rescued endangered wildlife: a man-eating tiger darted and transported from Chitwan, rescued leopards, Eurasian owls, and more recently a pair of red panda cubs found and raised by a couple in Rolpa. 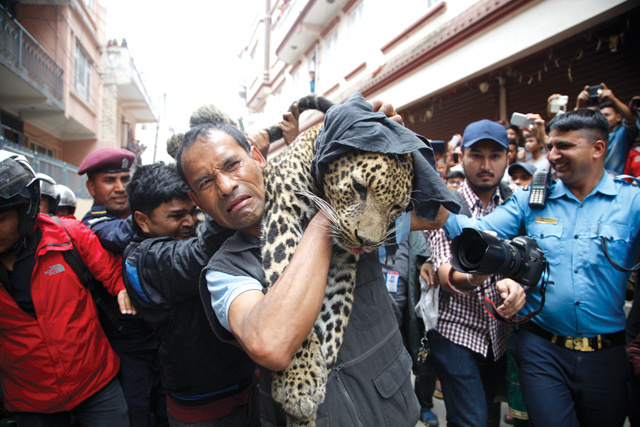 Zoo vet Radha Krishna Gharti carries a tranquilised leopard from a house in Kuleshwor to be translocated to Shivapuri National Park. In the past year alone, 368 rescued animals have found their way to the Central Zoo, and this figure is almost double than a year before. 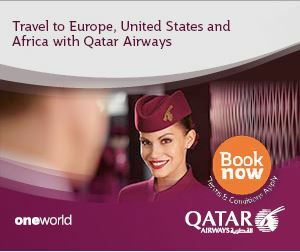 Among them 148 were adopted by the Zoo, 133 were released back into the wild, and 87 died in the quarantine facility. “We release them once we know they can make it out there, otherwise we usually keep injured or the ones we think cannot survive in the wild,” said Koirala. While some animals are brought from various parts of the country, what keeps the zoo busy these days are rescue operations in Kathmandu itself — especially since wildlife like leopards have started straying into the city. Gharti has already rescued three leopards since July, and his expertise in capturing the spotted big cats has earned him the title ‘Leopard Catcher’. A Mahindra pickup equipped with tranquilliser dart guns and nets is permanently on standby for Gharti and his rescue team. The government has a plan to set up wildlife rescue centres near protected areas across the country, but till that happens the Central Zoo in Kathmandu will continue to be a refuge for rescued animals. 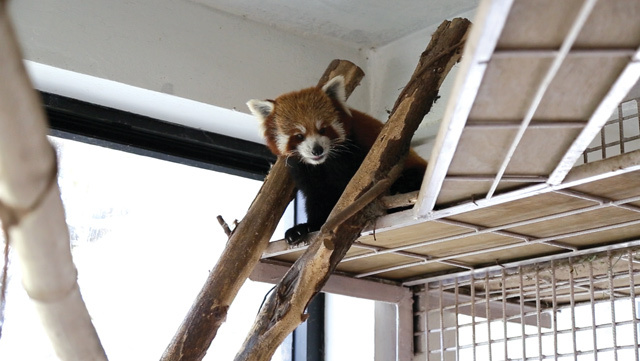 Red Panda cubs rescued in Rolpa were also given refuge at the Central Zoo last year. “The Zoo is having a difficult time coping with the overwhelming number of rescues,” said Ghana S Gurung of World Wildlife Fund (WWF) Nepal. The Zoo is running out of space and is overcrowded. There is a plan to transfer the bigger animals in the Zoo to a new 245 hectare facility in Surya Binayak, but the Zoo will have to manage the best it can till it opens. “With a bigger zoo in Surya Binayak it will be easier to house rescued wildlife, and other animals will also have more space,” said Deputy Director General of Department of National Parks and Wildlife Conservation, Gopal Bhattarai. The Surya Binayak site is being demarcated and levelled and will be designed to comply to modern zoo standards by providing animals space and vegetation much closer to their natural habitat. “The zoo in Jawalakhel will be upgraded and continue with its conservation education programs,” explained Govinda Gajurel of National Trust for Nature Conservation (NTNC).